Sometimes it's hard to see something if you absolutely don't want to see it. Will isn't the ideal boyfriend Anna thought he would be, but she doesn't see there's something wrong for a very long time. I often felt sad for her because she's missing so much in her life. She isn't from a warm and loving home, she hasn't seen her mother in quite a while and she's insecure about a lot of things. It's why Will can come so close, she loves that he cares about her. I liked that the story isn't only being told from Anna's point of view, but that the reader also has the chance to find out more about Will. Even though there's a clear picture of right and wrong nothing is completely black or white which greatly surprised and impressed me. I think Eve Ainsworth has written a story that every young girl should read. 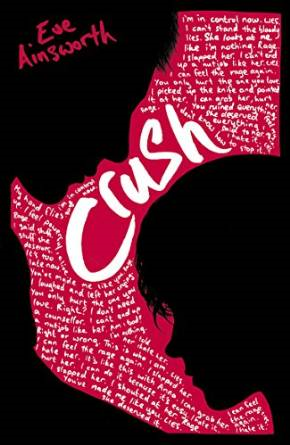 Crush is a story with a strong message and she presents it in a beautiful way. I wanted so much more for Anna and could literally feel her pain and her sorrows. She's a sweet girl who tries to make the best of things, but she has a lot to learn as well. Unfortunately she has to do that the hard way. Some of the scenes are absolutely heartbreaking. Crush is a book filled with many emotions and I admire the way Eve Ainsworth describes them. She handles the sensitive topic of an unhealthy relationship in a loving and caring way without losing the rawness and harshness of the situation. The easy flow of the writing balances the difficult topic, it's a combination that works very well. Crush is a strong and gripping story, it's absolutely amazing.